Historic Herkimer meth-making encampment, just off East State Street in Herkimer. 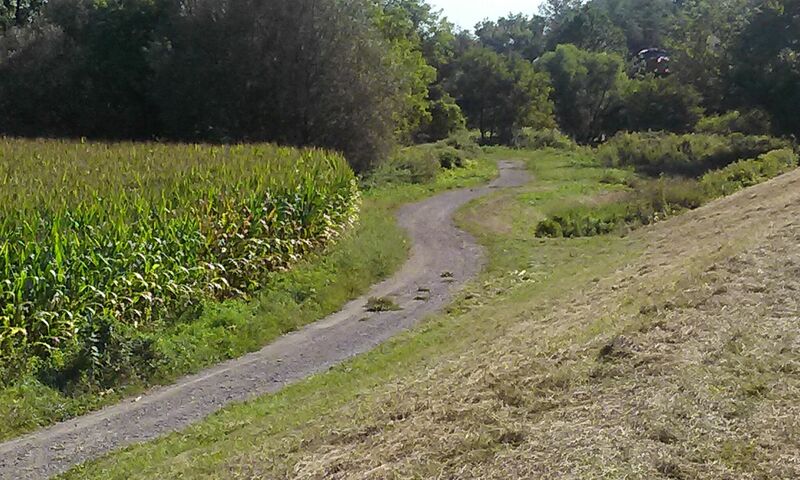 Herkimer – Discarded child’s clothing, entrance to dirt road (CSX access road). It’s just off of the south side NY RT 5, where RT 5 crosses West Canada Creek. While things are much quieter here in south Herkimer Village than they’ve probably been in the last decade, it’s not too late to see a historic Herkimer meth encampment. As you drive along Route 5 from the commercial center of Herkimer east towards Little Falls and just before you cross the bridge over West Canada Creek, you’ll see a dirt road on the right. After a hundred feet or so, it passes an earthen flood control barrier on the left. Walk along the top of the barrier in the direction of the old Herkimer Trolley Bridge for just a few yards, then head down the slope to the right continuing towards an area of ancient gnarled trees and brambles. Nestled within you’ll see a tarp, sleeping bag, child’s blanket, empty jar, part of a chair, and sheltered wood dry for a new fire. Imagine what it was like camping here, and how visible it would have been from the main road to any folks driving between Herkimer and Lowe’s and glancing towards south, and of course from the score of windows of Herkimer’s high-rise Nathan Galinsky apartments, a few hundred yards the other side of the dirt road. After touring the old meth encampment, continue on down the dirt road about 1/4 of a mile, and turn left onto the cornfield road. At its end lies the eerie Herkimer Meth Bridge. And if your schedule permits, round out your Herkimer narcotics tour with a visit to the historic Herkimer Crack House, just a few minutes away at 318 Pleasant Avenue. Herkimer’s welcoming crack house keeper’s always happy to chat with passersby. Abandoned child’s pullover, near historic Herkimer Meth Encampment. Looking south toward Herkimer Village cornfield. Historic Herkimer Meth encampment is in trees to the left. The Herkimer Meth Bridge is just the other side of the cornfield. Historic Herkimer Meth Making Encampment lies between the trees. Historic Herkimer Meth Making Encampment. Next Next post: Welcome New Neighbors At Herkimer’s 328 Pleasant Avenue!